Ian Rive, Dino Psaras and Steve Ronan, three psy trance dinosaurs responsible for dropping numerous old school classics under various pseudonyms and taking parts in countless legendary production outputs, teamed up to drop this pretty original and atypical album on the always challenging Blue Room Released label. Basically, it deviates from the former sound these veterans were involved in, staying clear of epic leads and synth orientated sounds, maintaining the focus on loud and industrial sound patterns, often chaotic, abrassive and unpolished, with occasional intrusions of heavy electronic guitar riffs. To followers of psy trance, this change of direction should come as no big surprise, as by 1999 most old school heavy weights were left on shaky grounds and in pursue of a new direction to follow. 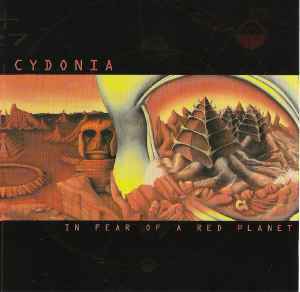 "In Fear Of A Red Planet" is quality material though. Doesn't wander off too far into those dullish minimal waters where most ventured into, but the trio doesn't even try to reignite the flame of the past and recycle the old goldies. Cydonia strikes a very nice balance between the old and the new school, right around the turn of the century. Though it may be a tad too rough and rush for the average psy/goa trance purist, it is well worth your try. It has a dated sound, no doubt, so if you weren't around to experience it back in the day, you could have a harder time while letting the album properly sink in and reach you to the fullest.